Becoming a Dealer - SPEEDCOAT Europe Ltd. Independent laboratory tests prove the SPEEDLINER EURO HC® product utilised by authorised SPEEDCOAT Europe Ltd. Dealers / Applicators to be the most versatile and probably the strongest polymer spray liner coating available! Why settle for an inferior product or a low quality DIY material? It appears that cracked shower trays in caravans and motorhomes is an inherant problem. Every year there are more and more ‘pre-owned’ caravans and motorhomes sold and exchanged that often have a cracked shower tray that has not been repaired or replaced due to the high cost of replacement, or more often a replacement unit is no longer available or the cost prohibitive labour involved. This gives the SPEEDCOAT Europe Ltd. Dealer / Applicator unequaled opportunities to carry out premium quality shower tray spray repair applications at acceptable prices. While the SPEEDCOAT Europe Ltd. repair system using the SPEEDLINER EURO HC® product is based upon sophisticated chemical technology its application process is relatively simple and extremely operator friendly. ‘On – Site’ training and ‘one-to-one’ technical support via phone or email are all part of the SPEEDCOAT Europe Ltd. Dealer package. The “make or break” factor with any new business venture is overcoming initial start-up costs. By choosing to become a SPEEDCOAT Europe Ltd. Dealer / Applicator we offer a reasonably priced ‘start-up’ package that includes liquid products, essential tools and equipment and comprehensive training.The SPEEDCOAT Europe Ltd. Dealer / Applicator ‘start-up’ package is only sold as an ‘add-on’ to an existing business with nationally recognized accreditation’s and/or affiliations in relation to the caravan and motorhome service and repair industry. We offer a very economical Dealer “get-started” package. 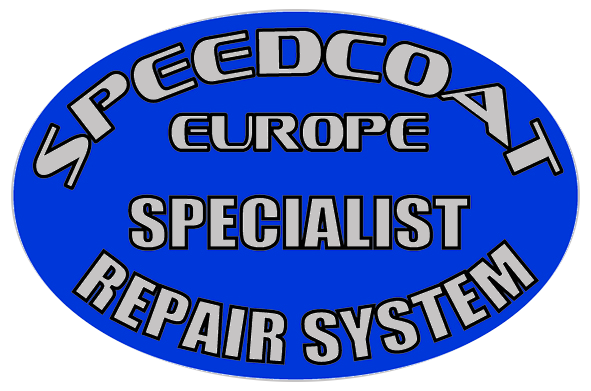 Once up and running you can purchase the SPEEDCOAT Europe Ltd. materials as and when you require them. No need to ‘sit on’ bulk stock. SPEEDCOAT Europe Ltd. supply generic advertising and promotional leaflets, brochures and product samples free of charge to all authorised SPEEDCOAT Europe Ltd. Dealers / Applicators. 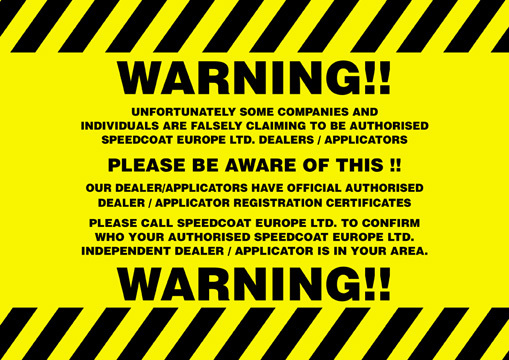 A SPEEDCOAT Europe Ltd. Dealer / Applicator package is a non-franchise operation and there are no ongoing charges, royalty fees for direct customer referrals and no imposed sales targets. A SPEEDCOAT Europe Ltd. undertake national advertising, marketing, product promotion and attend major specific market exhibitions.